One of the drawbacks for me for a smooth frittata-making process is having to transfer the almost-set egg mixture from my non-stick non-ovenproof skillet to my cast iron skillet so that I can put it under the broiler at the end to set the top and brown the cheese. When I had to replace my last non-stick skillet, I tried to find one that had an oven-proof handle but was not successful, so I have been resigned to starting the frittata in my non-stock pan and transferring it to the cast iron pan just before putting it under the broiler. It's not the end of the world, but it's one extra step that I have to take and one extra dish that I have to clean. 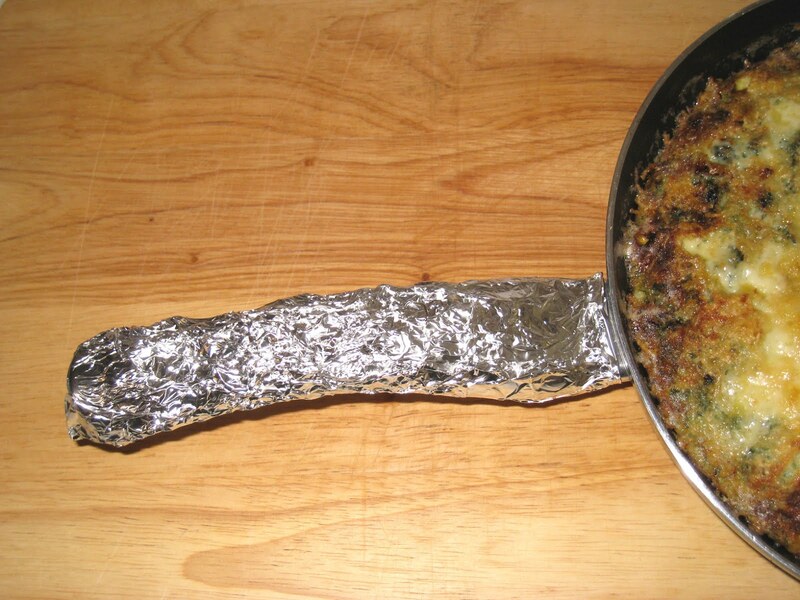 I had recently read about wrapping the handle in aluminum foil before putting it under the broiler. I was somewhat skeptical, but I having to use the two pans has started to determine whether or not I feel like making frittatas at all, which would be a tragedy, as they have become something of a staple in my kitchen. My skillet was not all that expensive so I finally decided it was time to give it a try, with the full understanding and expectation that I might be buying a new nonstick skillet sooner than I had planned. But it worked like a charm. I rolled out a piece that was long enough to double over before I wrapped it, so it was at least 4 layers thick, and I made sure to cover the handle down past where it meets the metal that attaches to the base of the pan. I sprinkled the cheese over the top of the frittata, held my breath and put it in the broiler for the usual two minutes. And the handle was fine. It did not melt. It did not change shape. I don't even think it got that hot, although I did not touch it to confirm that. I suspect the handle would have been fine regardless, since most handles these days are oven safe up to 500 deg. F., and I don't know that it gets that hot that quickly under the broiler. But this trick makes it even less likely that there will be a problem. Being the environmentally conscious person I try to be, I was even able to unwrap the foil in such a way that I will be able to use it again. It may not be as exciting a concept for me as my stick blender, but it's a close second. Why not just cook the whole thing in cast iron, and skip the transfer and avoid the non stick treated surface?